Christchurch actors Nicki Reece(left) and Mark Hadlow at read through for the "Great Art War", a play commissioned by CAHT, May 2010. 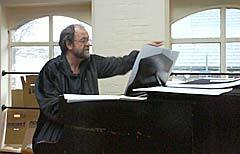 Christchurch composer Philip Norman at a Court Theatre read through of "The Great Art War", May 2010. 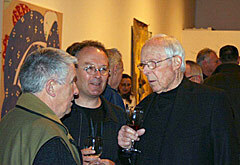 Participating artists Barry Cleavin and the late Don Peebles at the Inner Landscapes launch. Canterbury Arts and Heritage Trust (CAHT) was incorporated as a charitable organisation in 1996. A main objective of the trust is to support and promote the work of artists in and from the Canterbury region. Its wider cultural objectives are to further community education and participation in the arts, and to facilitate increased arts activity in the Canterbury region. These objectives are achieved through a variety of special projects undertaken annually by the trust in response to specific needs identified within the local arts community. Over the years the trust has produced numerous public events to the benefit of the wider community as well as local professional artists across many arts disciplines, including music and theatre. For the past decade the trust has worked mainly in the area of fine arts, with events covering a variety of contemporary art practice including sculpture, painting and photography. In 2005 CAHT won an award from the Human Rights Commission for promoting racial harmony through a community-based multi-cultural photographic event in which professional photographers worked with members of the local refugee community. The resulting photographs were framed and became part of a permanent display in the Christchurch Public Library. 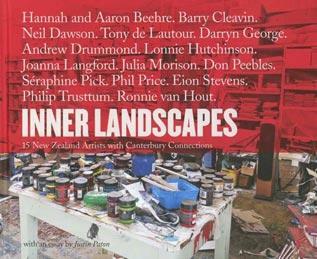 As a recent fund-raising project CAHT produced in 2009 a book on fifteen acclaimed artists associated with the University of Canterbury’s School of Fine Arts. 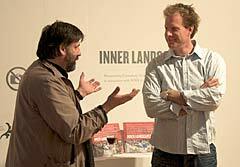 Entitled “Inner Landscapes”, the book was published by the Canterbury University Press and the works featured in the book were exhibited at SoFA gallery when the book was launched for the Christchurch Arts Festival. Proceeds from book sales have funded the CAHT Travel Award, a new grant offered for the first time by the trust in 2011,to assist recent graduates from the Ilam school to further develop their art practice by travelling overseas. Also in 2009, with funds from Creative New Zealand, CAHT commissioned a musical drama, “The Great Art War” by playwright Stuart Hoar and Christchurch composer Phillip Norman. The theatre piece is a witty exploration of issues raised during a controversy which erupted in the 1940’s when two progressive members of the then Canterbury Society of Arts decided to purchase for the city Francis Hodgkins’ modernist painting, “The Pleasure Garden”. The play reveals many of the social, political and art appreciation issues which ultimately divided the nation more than seventy years ago still resonate today. The trust’s most recent project, ARTiculate, has been developed to document the response of artists living and working in Canterbury who have lost work, studios, exhibition opportunities and in some cases tragically even homes and friends in the earthquakes of September 4 2010, February 22 and June 13 2011. Lorraine North M.A (Hons); BA, Chair and founding member of the trust , a producer of independent arts events for the past twenty years and literary researcher. Mark Prain, a graduate of Toi Whakaari and founder/Executive Director of the Hillary Institute of International Leadership. Dr Warren Feeney, curator, art commentator and critic, a past director of the Centre of Contemporary Art in Christchurch. Warren is also the founding director of the newly established gallery Chambers@241. Coralie Winn founder/director of Gap Filler, a programme of creative events to activate sites around the city made vacant as a result of the Canterbury earthquakes in 2010 and 2011.